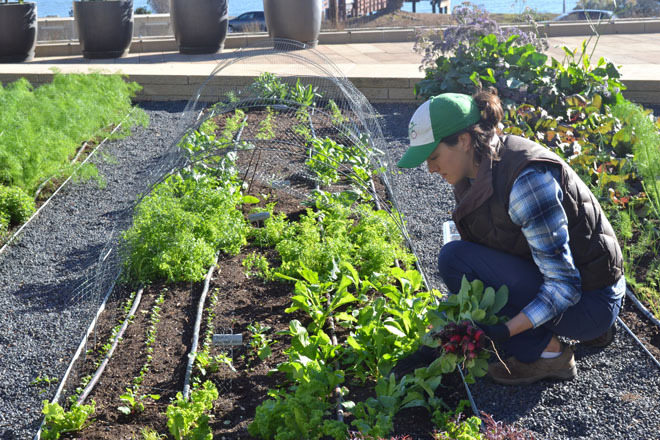 As the sun begins to inch above the San Francisco skyline on a see-your-breath November morning, farmers and kitchen staff are already moving across the rooftop at STEM Kitchen|Garden, a farm-to-table restaurant topped with an on-site farm. Farmscape farmer Nicole Doonan seeds microgreens such as peppercress and saltwort. The bartender snips nasturtium and borage blossoms for drink garnishes. The pizzaiolo is grabbing sage and lemons to blend into a fresh ricotta topping for his squash pizza. Just beyond the farm is San Francisco Bay’s last working shipyard where vessels the size of city blocks are docked for repairs. By the time the restaurant opens, the farm staff will have pulled 50 pounds of fresh lettuce, kale, herbs, peas, beets, carrots, and radishes into the back of the house for washing. Those items will be on the menu later today or tomorrow, served up in STEM’s garden-based salads, soups, and pizzas. This happens each morning before the busy restaurant opens for lunch in an office district within Mission Bay, a completely rebuilt neighborhood in southeast San Francisco. 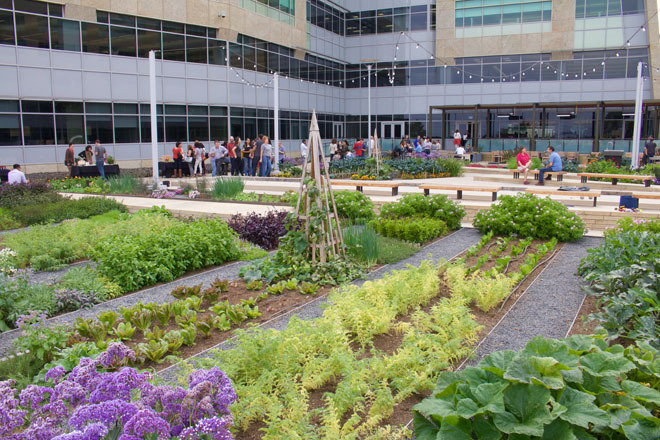 This rooftop farm was the brainchild of Bon Appetit Management Company—a foodservice management company responsible for spearheading many sustainable practices within the food and beverage industry. Its vision for the restaurant centered on the idea of a garden-inspired menu featuring the freshest local produce. The vision has been realized and, in the process, Bon Appétit has created an ecosystem worth copying. I was first invited to view this space in October, 2014 as part of an evaluation with Farmscape, California’s largest urban farming venture. Our primary concern was if the space could produce a reasonable harvest. 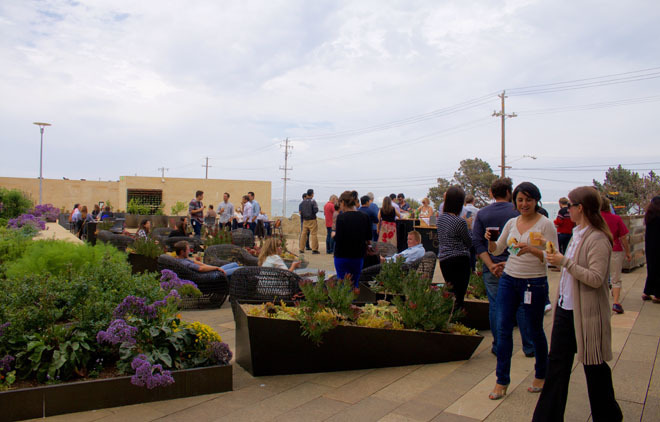 During our initial inspection, the garden was cool and misty and consisted of empty planters on a roof above the building’s parking garage. Could we get a decent yield in the foggy location with a steady wind coming off of the Bay? Beyond the garage, a series of active construction sites prompted our next question. With no green space in sight, where were the pollinators going to come from? As it turns out, our worries were unfounded. 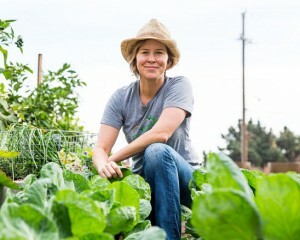 As soon as plant starts arrived from the Farmscape nursery in Oakland, nature followed. And within several weeks we had a thriving insect community. Now visitors from the neighboring urban preschool can view ladybugs, butterflies, bees, and lacewings, as well as dreaded aphids and cabbage loopers. As for the fog, shade, and wind, we got an unexpected assist from huge windows on the office buildings next door that reflect sun and heat into the site. We’re often asked, “How much can a rooftop farm in foggy San Francisco actually produce?” Let’s do the math. Not counting pathways, seating, and the bocce court, STEM farm has about 1,200 square feet of growing space. At Farmscape, we average between three to five pounds of produce per square foot annually. This means we haul in between 3,600 to 6,000 pounds of produce at STEM per year. Not bad for a rooftop next to the Bay. Most of the crops we grow at the site are highly specialized items, such as microgreens, edible flowers, and fine-leafed herbs that come with a hefty wholesale price tag and can get damaged during transport from farm to market. Growing on site means we can improve the quality of the produce and add to the restaurant’s bottom line. Each year we plan the garden with Executive Chef Brent Johnson and his staff. In general, chefs are even more “out there” than farmers when it comes to choosing crops. If we mention an unusual heirloom crop, it doesn’t take long for Brent to discuss the possibility of cultivating other heirlooms for STEM. “Farm to table’’ doesn’t do the chef’s work justice. Instead, he elevates our crops to an art form on the plate. I know—I’ve been the grateful beneficiary of more than a few memorable salads direct from our gardens. We also grow a number of “chef experiments” with Brent and the staff. For example, we are investigating which mint makes the best mint chocolate chip ice cream. We’re growing ‘Kentucky Colonel’ mint, spearmint, peppermint, chocolate mint, orange mint, apple mint, Laotian mint—so far, the frontrunner—and Yerba buena. 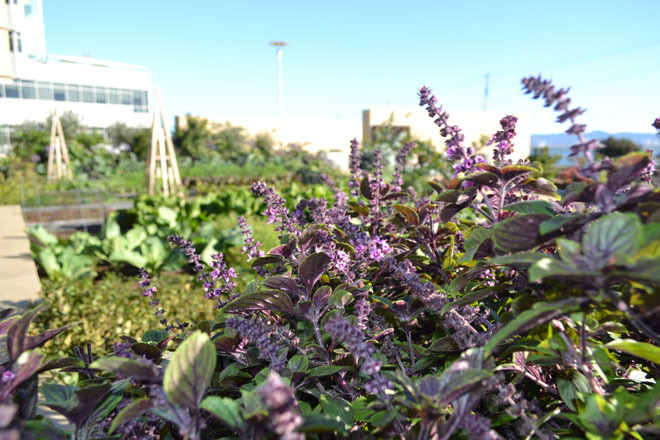 As mint mysteries go, we’re happy to help on our San Francisco urban farms. Scented geraniums are another major crop. We grow peppermint, rose, lemon, and lemon rose varieties. Bartender Ali Sheets uses the flowers and foliage as a garnish in everything from non-alcoholic shrubs to martinis and margaritas. In the garden, the lush plants serve as an additional layer of protection for delicate young seedlings when the wind moves from “gentle bay breeze” to “hurricane death gale.” The geraniums are probably the most touched plant in the garden. Kids love the mossy leaves and the funky perfumes they emit. This garden serves the neighborhood in a larger way by functioning as a stormwater filtration system. 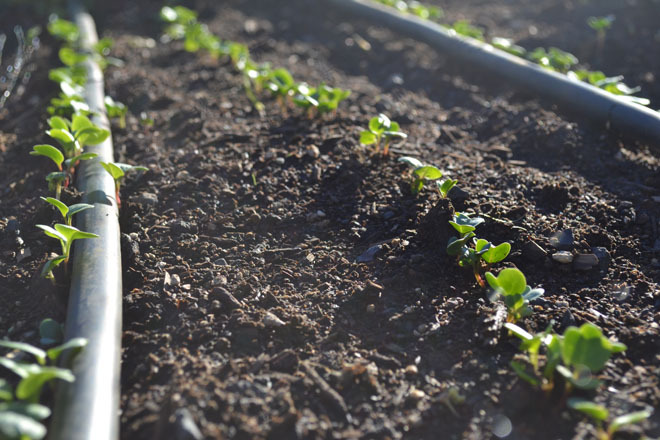 Rainfall, an often-limited resource in our Northern California region, is captured in the farm’s gravel pathways and soil beds and used to irrigate the crops. 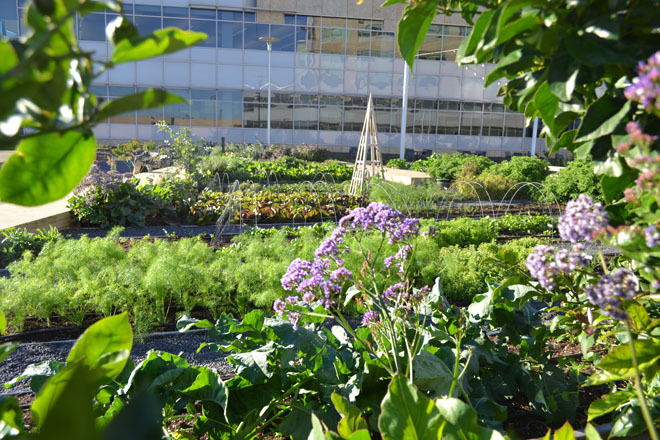 Finally, the garden is successful in how it functions as the proverbial “third place” for Mission Bay residents. The neighborhood is largely filled with apartment buildings and offices with little green space that is open to the public. 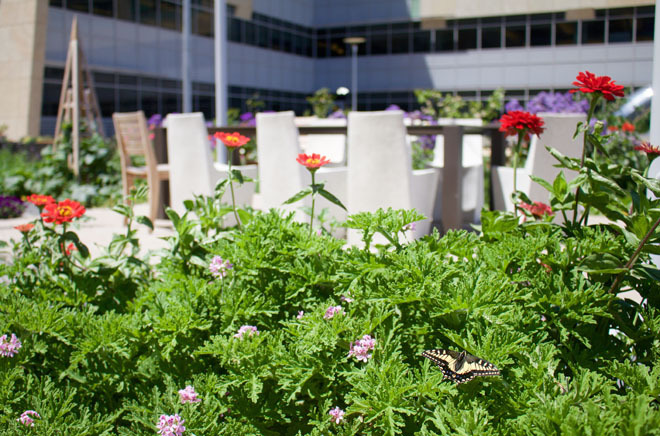 The garden at STEM has become an outdoor living room for the neighborhood. We have a bocce court in the middle of the garden, bonfire pits, garden workshops, great food and drink, and the best view of the Bay. It’s great to see people enjoy this farm in the city! ED: Initial design for the rooftop garden was created by Antonia Bava Landscape Architects.